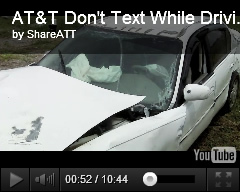 I agree, fiddling with a phone while driving is so incredibly dangerous. I don't text, talk, email, or otherwise do anything with a phone while driving. Talking on a cell phone while driving is also illegal in my state now, but even before it was I refused to do it. I do everything I can to avoid any distractions while driving, phone or not, because the risk of an accident is a very real one. I can't watch the documentary because it will make me too sad, but I'm really glad it's out there and hopefully it will get the right message across to those who need to hear it. I totally agree. Texting and driving is dangerous. It can wait! I am so glad for this campaign. The amount of kids who die from texting and driving is scary and horrible. This is a cause that is near and dear to me. My cousin caused an accident while *reaching* for her phone that killed a 14 month old. It's a tragedy that was completely avoidable. I take part in the Phone Down Eyes Up challenge extended by motherly Law. When we are in the car (unless I am in the passenger seat) my phone is off and in my purse behind my seat.